A couple weeks ago I mentioned that I had added The Forge Studios to the +12 Links of Helpfulness page because I started funding their Patreon campaign. 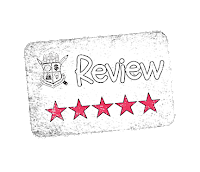 Initially Maciej Zagórski had reached out to me regarding some of the free stuff he made that had been featured as a Free GM Resource. He wanted me to know that he was working on revamping his webpage where said freebies were stored. After some back & forth emails I learned about his Patreon and he sent me some PDF files for review. 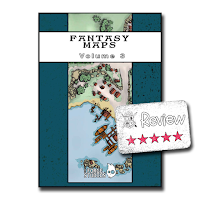 The most appropriate file for review was Fantasy Maps #3. Now I'll freely admit I'm a bit of a sucker for nice B&W artwork, so these ten B&W maps were right up my alley. Almost a shame that only the cover is in color, but when/if I use these maps, I wouldn't want them in color. It'd be a waste of ink, at least for me, and it would actually make it more difficult for me to add notes directly to the map.....I'll get back to that in a second. 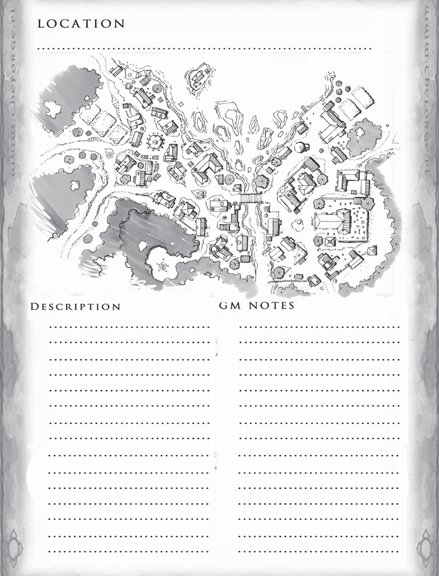 Fantasy Maps #3 is a 32 page A4 formatted PDF that comes in at 7.85 MB. To me that seems kind of large for a mostly black & white PDF, but every page is a full page graphic and you have to really zoom in, past 200%, before things look pixelated. The pages print up quite well, which is what you want with a product like this. My copy was sent direct instead of through DriveThruRPG and my version was not watermarked or secured. When looking at the product page for this item the listing shows that it should be a Watermarked PDF. I'm pointing this out because if you purchase this it might behave slightly different. Might being the operative word because I know when you upload a PDF, OBS automagically tags it as a Watermarked PDF, even if you didn't check the little box to make it a Watermarked PDF. 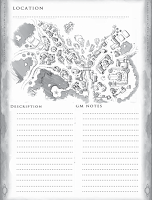 The layout of Fantasy Maps #3 follows a steady pattern: full page map, full page map with grid, and then a reduced sized and rotated map with lines for notes. At first I wasn't a big fan of the fact that the map on the notes page was rotated, assuming I'd have difficulty switching back and forth between the two maps if I had put out the full-sized map for the players to see. Then I realized that was kind of stupid, for reasons I won't go into. The notes page is a nice touch and I like the space for adding your own name for the location. The ability to right out notes is why I really like that these are black & white maps. I can easily make notations on the map itself in pen/pencil/whatever. If the map was a full color-printout it would be much more difficult to write anywhere but the given spaces. Maybe I want to color in houses the PCs visit or I want to quickly circle a specific house for some reason. My options are pretty open on a B&W page. Each page has a greyscale border that I could care less about. It does add a nice & consistent look to the pages, but the effect is lost on me as far as using this at my table. 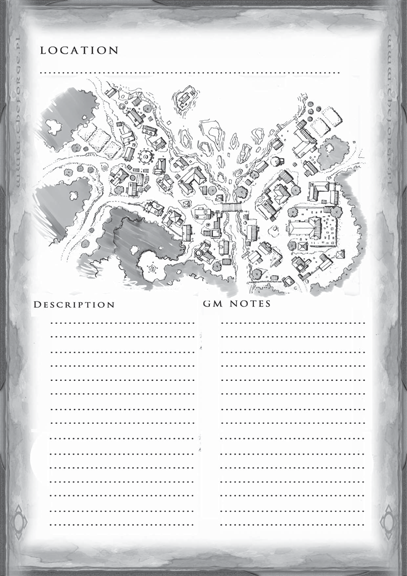 Because Fantasy Maps #3 was an A4 product, I went ahead and opened a page up in Photoshop and cropped the page to Letter sized, making an assumption that I needed a 1/4" margin on all sides for printing. I was quite pleased that this didn't cut into the actual map or notes area any. Overall I really liked Fantasy Maps #3. Ten fantasy locations presented in a GM-friendly format. With a product like this and a list of NPC names, maybe some pre-generated business, I'm good to go for my game. While I enjoy making maps and populating locales, that is a LOT of work. If the players don't go where I expect them to I need something fast & easy to work with. I can always back-fill in buildings after the session is over and I'm prepping for the next one. 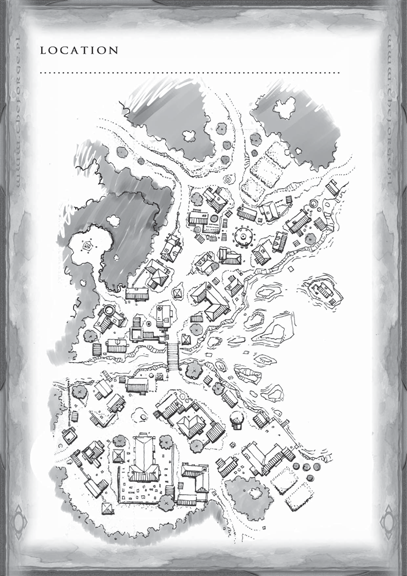 Even if you don't GM the way I do I think you'll get a lot of good use out of Fantasy Maps #3. At 40 cents a map, it is also a great price!